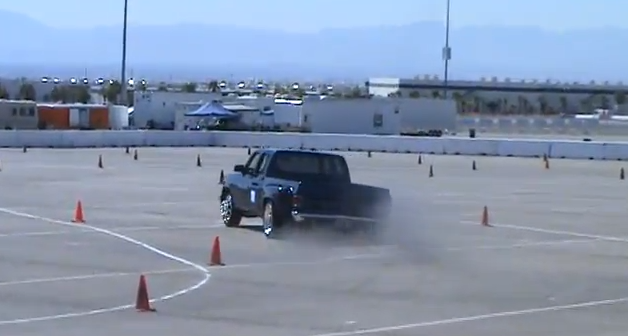 Video: Watch A Huge And High Horsepower Dually Run The Autocross At Super Chevy Las Vegas! In the scope of things that rule, seeing guys in laid out dually trucks attack an autocross course with zeal ranks right up there. Added bonus points are given for this dude because his truck obviously has a LOT of snot because it lights up those huge rear tires (all four of em!) a couple times during the this recorded run from a Super Chevy Show in Las Vegas. We don’t have much in the way of details regarding the truck but we dig the stock look body and ride height. The wheels aren’t totally our taste, but the proof is in the pudding here and this big truck does a pretty good job hustling around the course. A couple of cones meet their doom, but it is only a couple, even though the truck seems to have the turning radius of a cruise ship. Being that it is a crew cab and full length bed, it gets a pass for that. We’re guessing power is from a worked LS motor or a big block because it really gets when the driver gooses the throttle. Seeing this big truck hang the tail is ultra cool. Bottom line…use your junk like this guy does! Big time fun! Press play below to see the dually GET AFTER IT! At least it is not a diesel….I’m just sayin’….